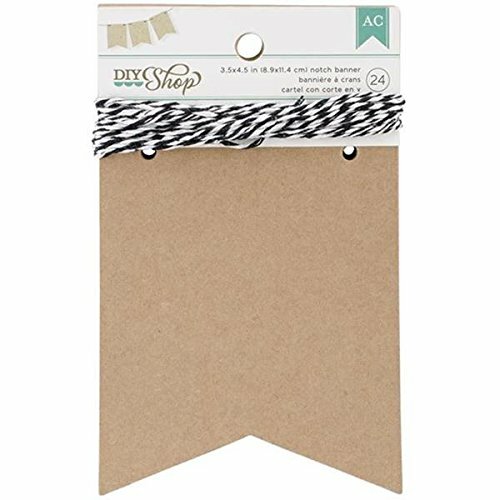 The DIY Shop Notch Banner by American Crafts is a 24-piece banner that allows you to create a unique decoration, filled with personal messages perfect for any occasion. Create fun, eye-catching banners for birthdays, weddings, holidays and more with this versatile set. This banner allows you to write unique messages with a variety of materials. Try American Crafts markers in a variety of colors (sold separately). Set includes 24 3.5 x 4.5-inch notch banners and black-and-white striped hanging string. 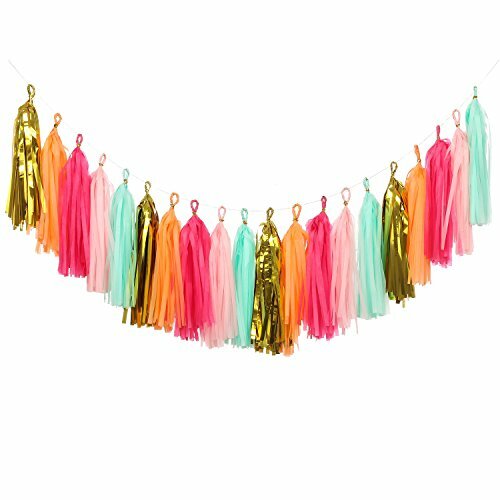 Decorate your party with this Colorful Letter Banner! It features white letters over a colorful background which is perfect for both casual and formal events. Simply hang this banner up for all to see! It's just the piece of décor your celebration needs. This pretty design is sure to delight all of your guests. Little Biene 30 Feet Nautical Glitter Paper Triangle Flag,Bunting Pennant Banner for Baby Birthday Shower/Ahoy/Achor/Pirate Theme Party Supplies Decorations(Blue and Silver). 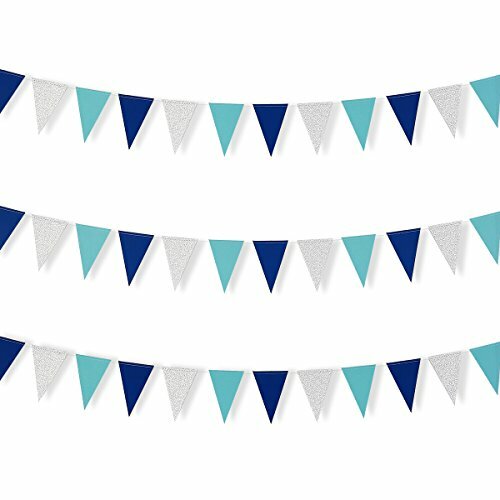 This nautical paper bounting banner kit include 3 set(3 strings) banner garlands,total 30 Feet 78 flags.These peannant strings are easy to hang and decorate for everyone indoor or outdoor. Hanging banner features:  Made of premium material  Double sided delightful glittery design  Delicate hand-made  Non-toxic enviromental material Using in many occasions The perfect choice for: Ahoy decorations  Pirate /Achor decorations. Engagement  Festivals  Home/nursery decorations  Wedding Please don't hesitate,choose our celebrated banners! We guarantee if you don't satisfy please return no reason,we will refund you immediately! 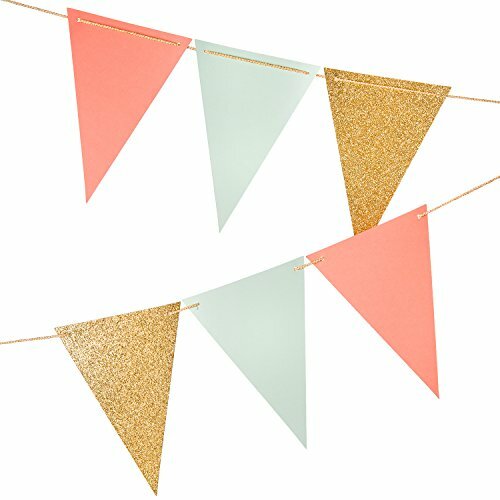 this triangle party banners are the perfect way to add that special touch to any party. 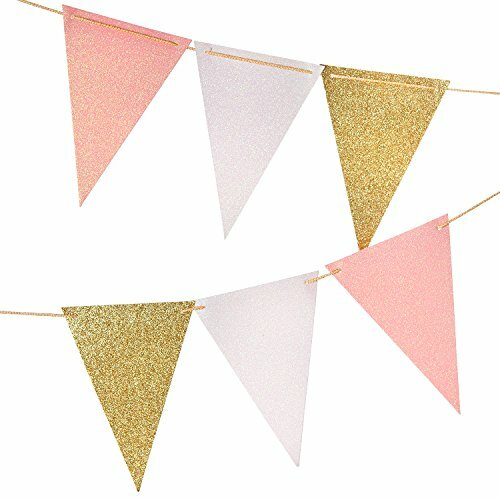 Included is a beautifully designed banner with 15 triangle pennants in the color gold. Each paper pennant for an exquisite touch. This banner comes pre-strung and won't require any further assembly. Simply hang them from ceilings, poles, banisters or tree branches. 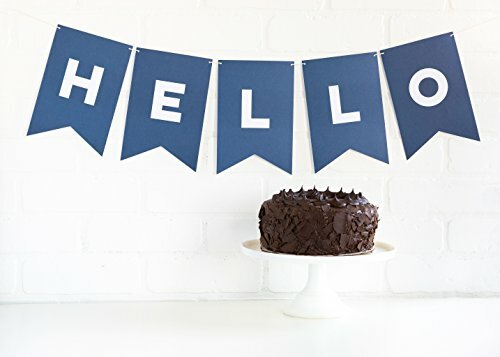 Perfect for all ages, genders, and party themes, these classy banners are sure to make any celebration memorable for years to come. The tassel is about 12" long after assembled. It is perfect for decorating wedding tables, birthday party, graduation party, baby shower, bridal shower or just hanging at dorm, bedroom. And it is great for making balloon tail garland too. This Plastic Papel Picado Banner is perfect for larger celebrations. It includes 3 banners and each banner can be attached to the other for those looking for longer sized banners. 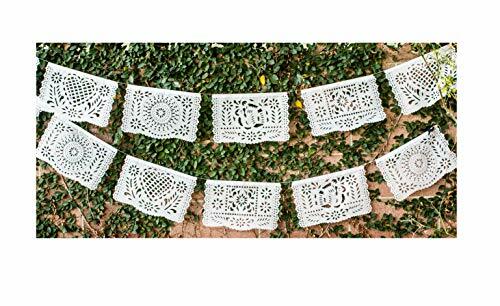 Papel Full of Wishes Medium Plastic White Papel Picado Banner - 12 Panels / 16 Feet Long Hanging - Ideal for Weddings, Baptisms, Birthdays, Posadas, Etc. Add this beautiful plastic picado banner to your next event for that special touch. This banner is over 16 feet long hanging and its made out of PLASTIC. 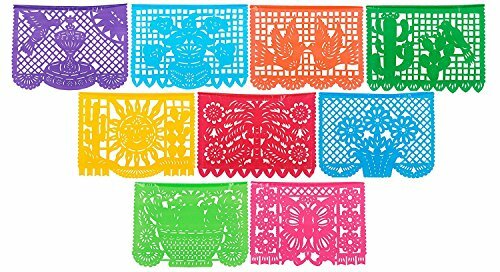 Papel Picado is widely used in Mexico for many celebrations and this piece of art has been used for generations and its a part of Mexican culture. You will not be disappointing with the quality of this Plastic Papel Picado Banner. Pink Ivory And Beige Tissue Paper Hanging Tassels.15 Pcs Party Tassel Garland Banner Decoration DIY Kit.Instructions Are Included.Great For Parties, Weddings, Birthdays, Holidays, Baby Showers Etc. To watch the Dripping Venom Tutorial, go here: http://tinyurl.com/hvnycjx In this Quick Tip Kris shows us how to create banners out of simple paper.